This HowTo describes the basics of writing your own app tests. SeqAn does not accept new apps into the repository so this document is less relevant for the future. SeqAn application tests allow the simple testing of apps: the application is run several times, each with a different set of parameters and/or input files. The output to STDOUT and STDERR is captured. The captured output and all files written by the application are then compared against “gold standard” output files that were previously generated. The general data flow for app tests is as follows (a simple working example are the app tests for the app pair_align). There are two major steps involved: (A) Test data generation and (B) actually running the tests. This is done once when preparing the test. The program is run with different parameters (in the case of pair_align with different algorithms, scores, alphabets etc) and input files (for pair_align, e.g. for proteins and DNA sequences). The output files and the output to stdout (logs) are collected. The output and logs are then stored as files in the SVN repository and serve as the reference for future comparisons. The expected output files are mostly generated by running a “sane” version of the program and then being checked for problems. Since there are a lot, they are usually generated by shell files, the generate_outputs.sh files. These files also serve as documentation which settings were used for which output files. Generally, they mirror the structure of the app test Python script (described below). To reiterate, the shell script is usually only executed once when the tests are created. The output needs to be regenerated only when the program output changes and this change is deliberate. They are not regenerated on each test run. Note that the path to the binary that is used to generate the output should be stored in a shell variable at the top of the file. This allows for easily changing this. These shell scripts should also be well-documented. See the generate_outputs.sh file of pair_align or tree_recon for simple and mostly clean examples. The app tests are then run in the nightly CMake builds and their results are submitted to CDash. There are two steps involved here: (1) Executing the programs and (2) comparing their result with the expected ones. There is a Python test driver program (called run_tests.py by convention) for each collection of app tests. 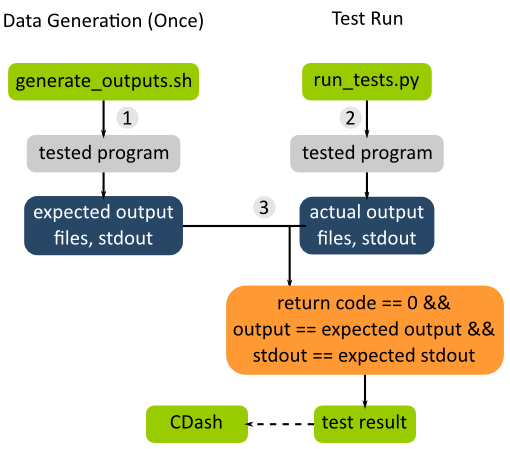 These programs us the Python module seqan.app_tests for running and usually mirror the corresponding generate_outputs.sh file. We will create app tests for a small app that converts its argument to upper case and prints it to stdout. First, create the app using skel.py. $ ./util/bin/skel.py app upcase . Then, go to your build directory (here: build/Debug), build the app, and make sure it works correctly. You can use the skel.py program to create the app tests. # Add app tests if Python interpreter could be found. Now, open the file apps/upcase/tests/generate_outputs.sh and modify it as follows. We now run the program two times with different arguments and stored the output in files simple.stdout and other.stdout. These files are kept in the directory apps/upcase/tests and can now go into version control. """Execute the tests for upcase. The golden test outputs are generated by the script generate_outputs.sh. # Automagically add util/py_lib to PYTHONPATH environment variable. """Main entry point of the script.""" # Auto-detect the binary path. # was generated in generate_outputs.sh. # test you want to run. # Output to the user. # Compute and return return code. Finally, we can run the program using ctest. In the case of failures, the output could be as follows. This is a common error that tells us that we have to appropriately set the environment variable PYTHONPATH so the module seqan.app_tests is available from within Python. You have to add util/py_lib to your PYTHONPATH. On Linux/Mac Os X, you can do this as follows (on Windows you have to set the environment variable, e.g. following this guide).